The fusion of social media in our lives is undeniable and it’s a trend that shows no signs of being supplanted. It deserves the full attention of its users, as they have started looking at it as a way to speak and share whatever they want with their peers. It is this interactivity that has encouraged online players to no longer ignore its prominence and thus looking ways to start engaging with their customers across these social networks. Social networks outperform traditional websites in a sense that they allow brands to communicate with their audience efficiently. However, there are some web companies, who are bit hesitant to take advantages of these social networking giants, such as Facebook, Tweeter, and Google+. The reason being- these services compel these companies to make certain adjustments in their existing services, which somewhere obstruct them to achieve their exact purpose. Also, big social networks are not ideal to create small social networks for a company. They cannot be targeted especially when you want to engage with your company’s employees and other local members. If these are some of your concerns, then it’s time to install BuddyPress. BuddyPress is a WordPress plugin that allows its users to convert their existing WordPress site to a private social network. The plugin lets your visitors to create detailed profiles, establish connections, form groups, share texts and videos, publish updates and more. Learning how to install and use it will definitely help you add an edge to your site, especially in the age where clients want more and more social integration. Now, let’s dig into the installation process of BuddyPress into your WordPress. The best thing about BuddyPress is that it is simple to install and use, all you need is just follow the below mentioned steps. Login to your WP dashboard, go to Plugins-> Add New. Here, search for BuddyPress, and start installing the same. Once the plugin is installed, “Activate” it. 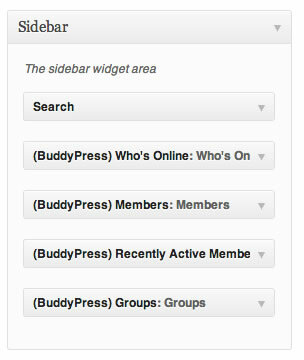 Once the BuddyPress is activated, you can see a new BuddyPress menu is created. As of now, you are provided with a basic set up, now go to the settings page, which informs you that you have successfully installed BuddyPress along with some few default components, which you can use or remove depending upon your needs. 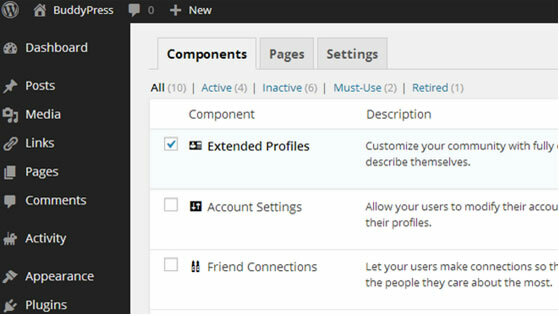 If even you choose to delete some components, make sure you don’t delete these two default components- “Extended Profiles” and “Account Settings”. 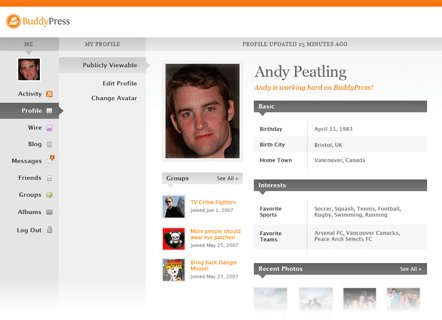 BuddyPress gives its users a number of custom profile fields which can be modified depending upon your needs. Now, you can see two main tabs in your WordPress dashboard. They are- “Activity” and “Groups”. Activity is what that is responsible for all the user activities across the BuddyPress installation. It shows every kind of activity by default and lets you sort them accordingly. Only admin has the authority to play around the “Activity” tab, and perform activities such as ‘creating a group’ or ‘registering a new member’. Public- This group is open and visible for all the members. Anyone can join it and the group will also be listed in the groups directory and the search results. Private Group- These groups are also visible and open to everyone, but only those who receive the membership request can join the group. Group activities and updates are only visible to group members. Hidden Group- Only users who are invited can become the member of this group. The group will not be listed in the directory or search results. Only group members can see the content and activities of the group. Groups can also have their own moderators, set by admins, and members can also be given the authority to set the amount of notification they would like to receive from a specific group. Along with the above widget, a login is also created to allow members sign in or register their accounts. Here, you can adjust the settings as per your requirements and then click on “save” to complete the installation process. Your BuddyPress is now ready to use. In this tutorial, we talked about the process of installing BuddyPress plugin in your WordPress site. Hopefully, you like it and refer it in the future. Samuel Dawson is being active in the field of Web Development from last few years. He is a web developer in Designs2HTML Ltd, a prominent psd to responsive html conversion service company. Being a passionate technology lover he also shares his knowledge on the web.